L-R: Chris McDonnell, Nuala Walsh, Sarah Kay, Mary O'Malley, Dr. Martin McAleese, President Mary McAleese, Helen McQuinn, Mary Gillespie, Maureen Conneely, Patricia Curran. 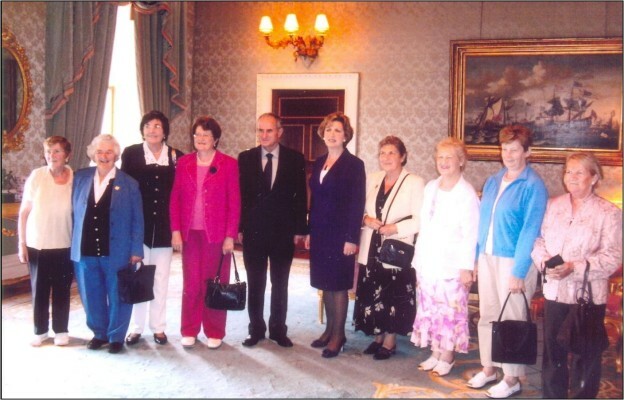 On 2 July, eight of us from the Oughterard Senior Citizens Group went to meet the President and her husband, Dr. Martin McAleese. We got a small bus driven by John Joe Reilly, which left us to the train at 9am to Heuston; then we got two taxis, four in each, to Áras an Uachtaráin. We had a snack and waited until our group was called to meet the President and her husband Martin. Then we had a look at all the statues and the bronze heads of past Presidents, and were given a talk on the history of the Áras – it was the home of all the British Viceroys down the years, and it was handed over to the Irish Government when we won independence. It has been the home of our first President, Dr. Douglas Hyde, and every other President since then. These are the names of the group who were chosen by lottery to travel: Nuala Walsh, Maureen Conneely, Mary Gillespie, Chris McDonnell, Sarah Kay, Mary O’.Malley, Helen McQuinn, and Patricia Curran. We were treated to a feast fit for a queen, and then to an address given by the President. She praised the work being done by all the communities all over Ireland and remarked that when she retired as President, she would like to work for communities herself. We had a wonderful time. Deo Gratias. Our thanks to Mary Kyne, who arranged our meeting with the President. This page was added on 03/06/2011.